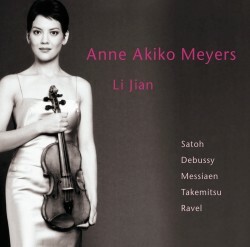 Japanese-American violinist Anne Akiko Meyers convincingly pairs the world of French music with contemporary Japanese works on her Avie debut. Sonatas by the fathers of French impression – Debussy and Ravel – foreshadow Messiaen’s Thème et variations, whose chordal structure evokes Takemitsu’s Distance de Fée. Anne gives the world premiere recording of Birds in Warped Time II by Japan’s most prominent living composer, Somei Satoh, whose work she is closely associated with, having also performed and recorded his Violin Concerto.